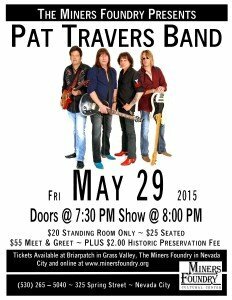 The Miners Foundry is pleased to present Pat Travers and the Pat Travers Band on Friday, May 29, 2015. 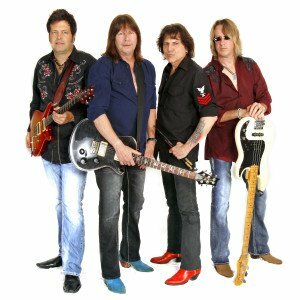 The Pat Travers Band is one seriously tight rocking unit, always delivering tangible energy and infectious enjoyment. Doors are at 7:30 p.m. and the show begins at 8:00 p.m.
Tickets are $20 Dancing Room Only, $25 Seated, and $55 VIP Meet & Greet. Ticketing fees may apply. Tickets are available online, by phone or in person at the Miners Foundry Box Office, or at Briar Patch Co-Op. Since the critically acclaimed 1976 debut album featuring his own brand of high quality seventies guitar rock and roll, Pat Travers has gone on to deliver melodic eighties rock, a blues period throughout most of the nineties, noted performances with various power trios during the Millennium and a full blooded return to the trademark Pat Travers Band sound as he enters his fifth decade of performing and recording. From the streets of Toronto, to the streets of London, to the streets of the WORLD, catch this band whenever and wherever you can. 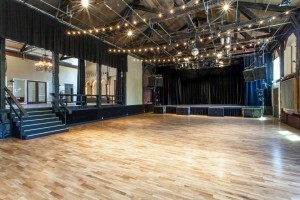 The Mission of the Miners Foundry Cultural Center is to preserve, enhance and utilize the historic Miners Foundry for cultural, educational and social activities. The Foundry is a non profit organization, pleased to support the Nevada County music community. To support cultural programming and the preservation of the historic Miners Foundry, please become a member or make a donation today.